We’ll help you GET NOTICED! 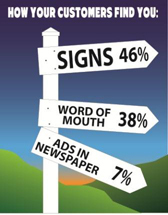 Your business signs tell your customers who you are, where you are and what you offer. An effective sign communicates this in a clear and concise message that is eye-catching and memorable. Trust Spot-On Signs & Graphics to help you GET NOTICED! Not sure where to start? That’s why we’re here! View our product gallery for ideas, use our online forms to ask a question, request an estimate, or just give us a call at (530) 295-8285. Looking for eco-friendly signs or LEED points? Spot-On Signs & Graphics uses solvent-free, water-based latex inks in our BERTL award-winning HP L2550 printer. We can offer a wide range of eco-friendly products for clients interested in sustainable products or LEED certification points such as recyclable banners, PVC-free wallpaper, and more. Learn more! Spot-On Signs & Graphics is a distributor for SignMojo' extensive line of ADA signs and office signs. The partnership allows us to offer you a wide variety of styles and price points that you can order directly through this link 24/7. Or, give us a call and we'll help you decide on the best sign and we'll even do the ordering for you! We try to make it simple! Spot-On Signs & Graphics is dedicated to providing our customers with ideal sign solutions. We strive to provide unparalleled service by listening to our clients, keeping our promises, and delivering a high quality product on time, every time. Serving Placerville, Cameron Park, El Dorado Hills, and surrounding areas, including El Dorado, Sacramento, Amador and Placer Counties. SignByte: You can increase product exposure by 180% with #floor#graphics placed in front of the product where people make a buying decision.